One of the special creatures we have here in the Komodo National Park is the dugong. 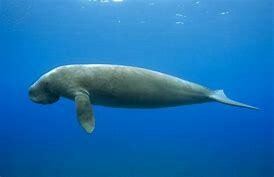 Dugongs, also known as “sea cows”, are a close relative of the manatee. Population of dugongs in the sea decreased drastically in the previous century because of the chemical pollution, uncontrolled hunting and accelerated coastal development. 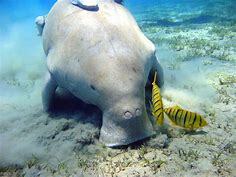 Dugongs are protected by law today, but their population is still at low number because of slow reproduction. The dugong is large marine mammal, usually around 3 metres in length and weighing around 420 kg. They have a flat tail and flippers like a whale, but are more closely related to an elephant and evolved 50 to 60 million years ago, when an elephant like creature entered the water. 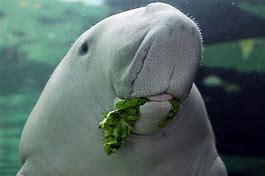 The dugong has large mouth with upper lip designed for bristling of sea grass, is a true vegetarian eating only sea grass. They breathes using the lungs, needing to reach the surface of the water every six minutes to breathe atmospheric oxygen. Dugongs can live on their own, in pairs or in larger groups. When in a group, they use various sounds to communicate, most often they use barks, chirps, squeaks and trills. Not a very fast swimmer, they normally swims 10 km per hour, but it can accelerate to around 22 km per hour when needed. 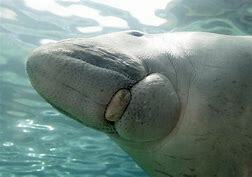 Male dugongs will develop tusks during puberty, at age between 12 and 15 years, while females usually do not have visible tusks. Dugongs reach sexual maturity between their 9th and 15th year, with males establishing and protecting their courtship territory. Females give birth every 3 to 7 years, and pregnancy lasts one year and ends with one calf. The bond between mother and the calf is very strong, the mother helps her baby to reach the surface of the water for its first breath. The calf stays with mother usually until the age of 18 months. Their main predators of are killer whales, sharks and crocodiles, though the biggest threat to their survival is associated with negative human activity. Dugongs can survive up to 70 years in protected habitats with enough food sources.